It’s no secret that the safety position is overcrowded in this year’s free agency period, with guys like Earl Thomas, Eric Weddle, Tyrann Mathieu, and others, signing with new teams. One safety who hasn’t signed yet is Tre Boston, a 26-year-old safety who earned a top-20 coverage grade at the position in each of the past two seasons. 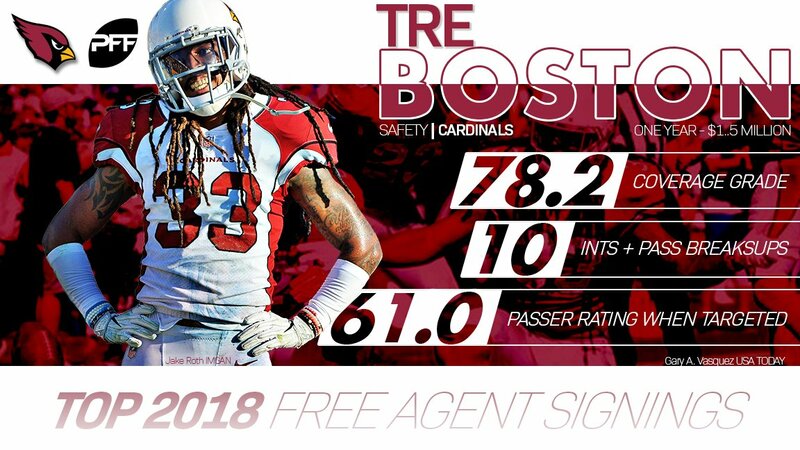 After breaking out in his contract year with the Chargers in 2017, Boston took a prove-it deal with the Cardinals last season and once again played very well on the field. As a result, Boston is currently ranked fourth among our top-25 remaining free agents. Boston is a true deep safety, having played nearly 600 of his 950 snaps at the free safety position last season, but he is versatile enough to play closer to the line of scrimmage when needed, as he logged nearly 200 snaps in the box in 2018. Regardless of where he lined up, Boston earned an overall grade of 74.1, which is the second-highest graded season of his five-year career in the NFL. He has yet to earn an overall grade below 70.0, despite playing with three different teams in just five seasons. Boston has developed a reputation for making plays on the ball during his short career, as evidenced by his 10 combined interceptions and pass breakups on 30 targets last season. Among safeties with at least 10 targets in 2018, Boston’s forced incompletion percentage of 26.7% ranked fourth. Considering that the longest pass Boston gave up in all of 2018 went for just 22 yards, his knack for making plays on the ball is even more impressive because he was rarely burned for big yardage. Boston ranks highly in several other coverage metrics as well. He allowed only 0.39 yards per cover snap last season, tying for 12th out of 60 safeties with at least 350 coverage snaps, and on average, Boston allowed a reception just once every 27.2 coverage snaps, which ranked 18th at the position. Perhaps most impressively, Boston allowed a passer rating of only 61.0 on targets into his coverage, fifth among safeties. When considering numbers only from slot coverage, Boston didn’t do nearly as well, as he allowed 2.19 yards per cover snap and a passer rating of 131.0 when lined up in the slot. Regardless, Boston is a solid deep coverage safety, and he has the size and speed to continue to make aggressive plays down the field while also limiting big plays. At only 26-years-old, Boston will be more than serviceable to any team that needs a deep coverage safety in 2019 and beyond. He is highly underrated for a guy who earned a coverage grade of 89.0 in 2017 and a 78.2 last season. With a resume consisting of solid play throughout his short career, Boston is a perfect low-risk, high-reward safety for teams willing to give him a shot.